New!!! Kokanee Creek Summer Camps!!! 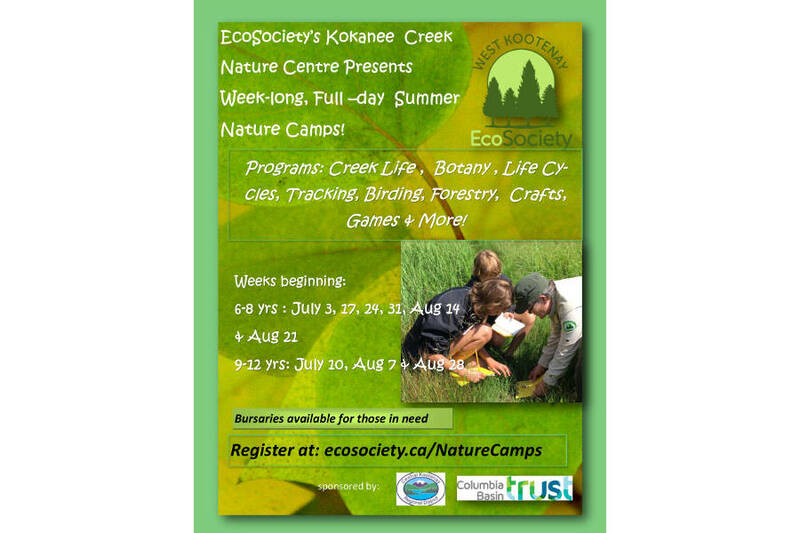 Kokanee Creek Nature Centre (run by the West Kootenay EcoSociety) is trying something new this summer: full-day, week-long summer camps for everyone! The Kokanee Creek Nature Centre is located in Kokanee Creek Provincial Park, approximately 20 minutes from Nelson. Need to find a ride to Kokanee Creek Nature Camps? Check out the EcoSociety’s Kootenay Rideshare Project! BC Transit also has a stop right in front of Kokanee Creek Provincial Park! The camps are outdoor based programs with a strong science theme. Bugs, stream biodiversity and chemistry, forest science, birding, botany, tracking, games, plus arts and crafts are all on offer at these camps. The camps run from July 3 to the end of August for ages 5-8 years old and 9-12 years old. Drop off time is 9AM (unless otherwise arranged) and pick up time is 3:30 to 4PM. There are bursaries available for those in need. Want to register? Go to the West Kootenay EcoSociety Website: ecosociety.ca/NatureCamps. See you at the park!! !